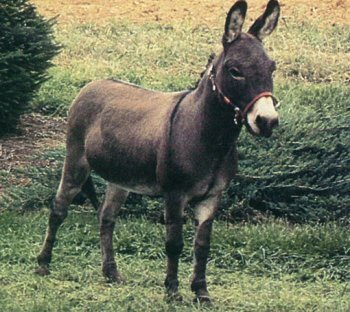 Miniature donkeys are native to the Mediterranean islands of Sicily and Sardinia. There they have been used for over two thousand years for transport, draft work, and as a power source for moving heavy mill stones for grinding wheat. Their milk was valued as a curative and skin treatment. Poppaea, wife of Roman Emperor, Nero, was legend to have kept a large herd to be milked for her baths. 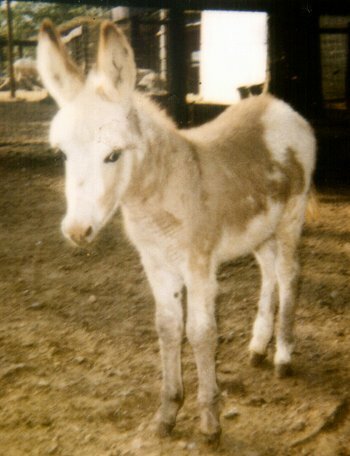 Miniature donkeys first made their appearance in the United States in 1929 when a group of seven was imported by Robert Green of New York. Later, the Busch family (of Anheuser Busch) imported a second herd. An association was established in 1958 to maintain the registry. In the Mediterranean region, many of the small working donkeys are being crossed with larger breeds, making their global population perilous. The continued conservation of the breed in North America is key to their continued survival. 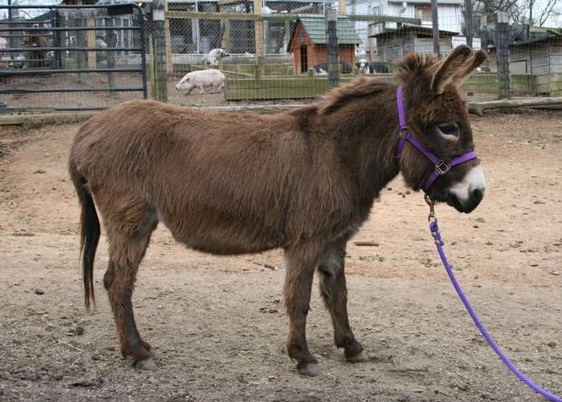 Miniature donkeys weigh between 200 and 450 pounds. Their height limit at maturity is 36 inches at the withers which is the last hair of the mane at the bottom of the neck. They are quite intelligent, curious, and very affectionate. 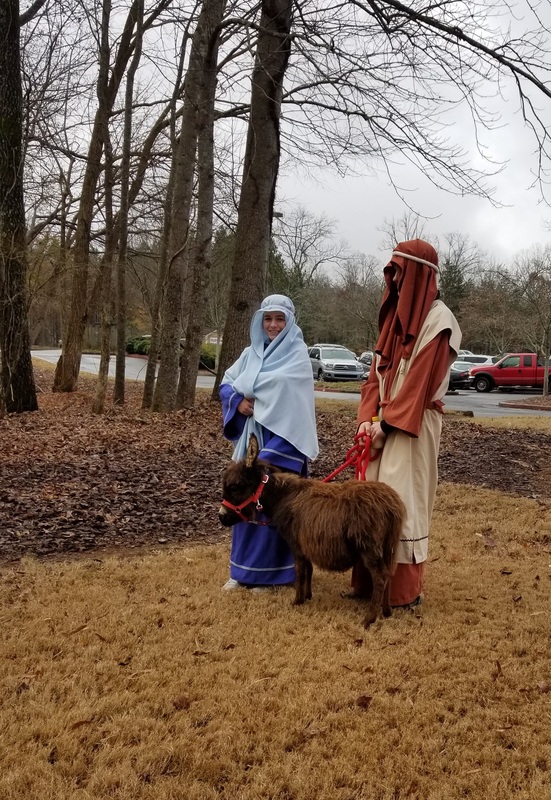 They are very easy to train to pull a cart or carry a small child. 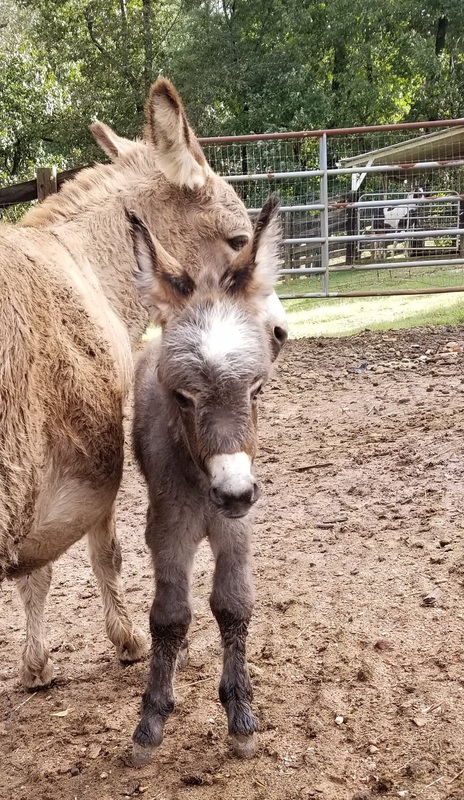 The most common color for miniature donkeys is gray-dun which consists of a gray colored body with a dark color dorsal stripe down the back and over the shoulders. This dorsal stripe is known as the “donkey’s cross” said to have been imprinted on the donkey’s back as it stood at Christ’s crucifixion. 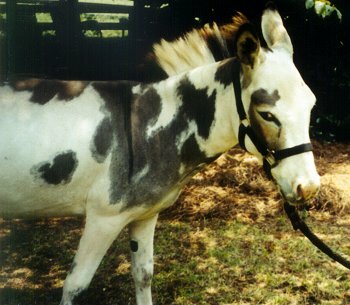 Miniature donkeys also come in variations of black/brown, white, spotted and roans. Colors other than typical gray-dun makes the donkey more exotic looking, therefore increasing their price. 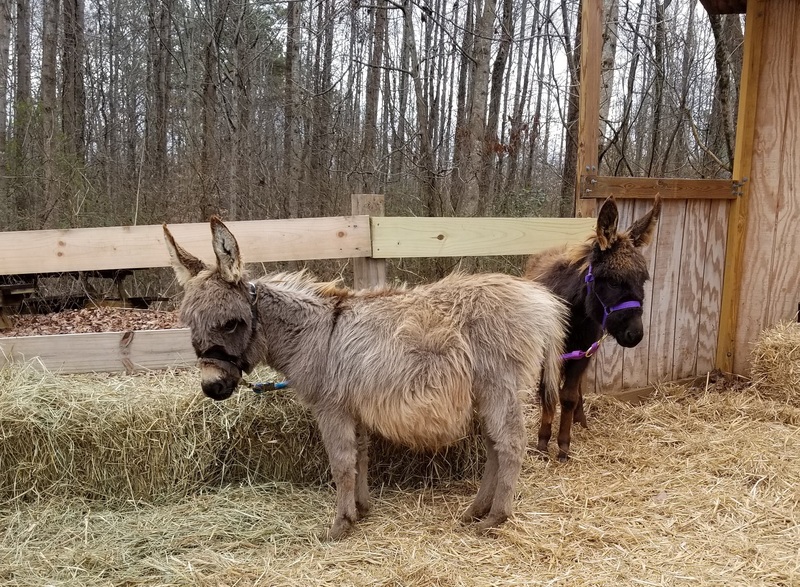 Miniature donkeys are members of the equine family. 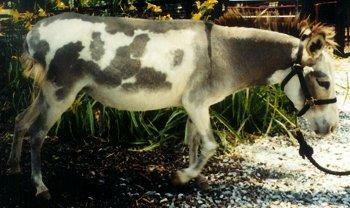 A cross between a donkey and a horse is called a mule, while a male horse and a female donkey produces a hinny. 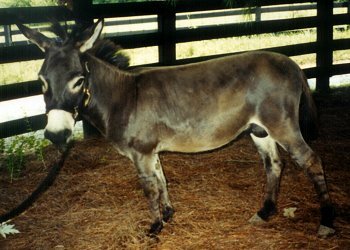 Male donkeys are called jacks. 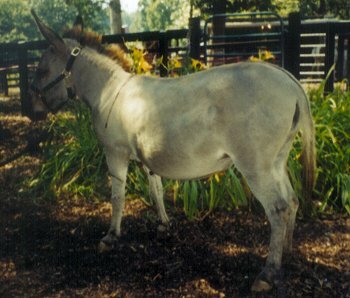 Female donkeys are called jennets or jenneys. 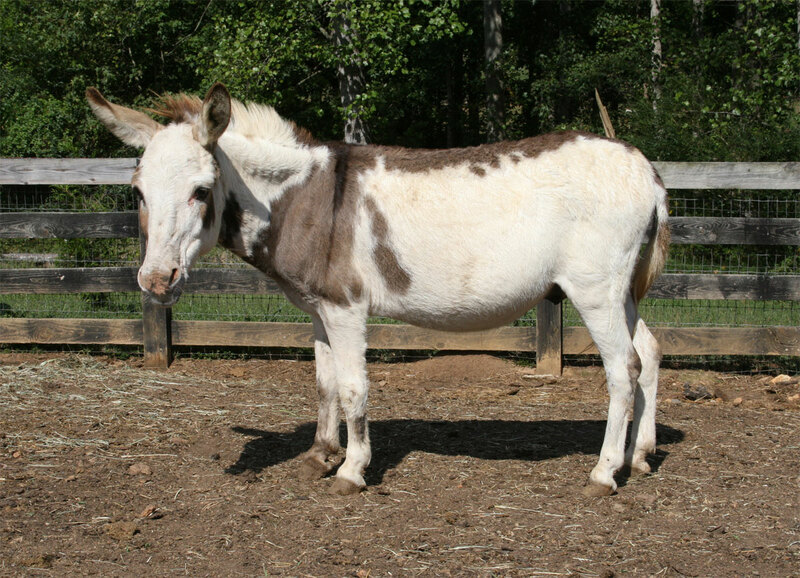 It takes a female donkey up to 13 months to have a baby. 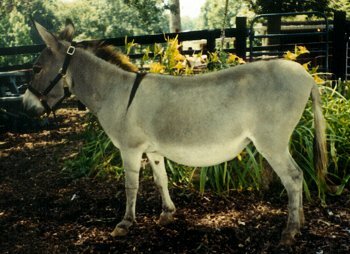 Donkey foals are weaned between 3 to 4 months of age. Their life span is approximately 30 to 35 years. Miniature donkeys by nature are one of the friendliest and most affectionate animals of its type. They are very tame and gentle. They love attention. They can be easily trained to be ridden or to pull a cart or wagon singly or as a team. They can pack a moderate load of cargo and can carry up to 100 pounds. They are very cautious and slow making them wonderful therapy animals for children and adults. 4/1/96, 33″, Grey Dun with Sorrel Points Registered Jennet. Buttercup has excellent conformation, is and always has been in excellent health. She is very gentle and very friendly. She has been a wonderful producer of beautiful foals. 12/15/94, 35”, Brown and White Spotted Registered Jennet. Sire: Kritter Korner’s February, 31.5”, Spotted. Dam: Why Not Farm April, 36”, Brown. Dinah is a beautifully marked Brown and White Spotted Jennet. She is very friendly and loves attention. She is a wonderful producer of show quality spotted foals. 8/10/01, Birth Height 19”, Gray and White Spotted Registered Jennet. Sire: Black Pepper Bandito, 32”, Black/Brown Jack. Dam: Merychippus Sugar, 34.5”, Gray Dun with Black Nose. Fiesta is a lovely Spotted Gray and White Jennet with a beautiful head, big expressive eyes, and perfect conformation. She is very tiny and correct. She loves attention and is very friendly. 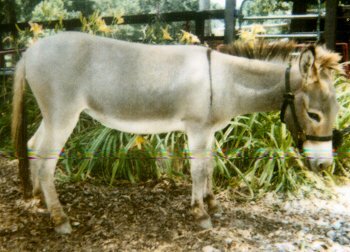 1985, 34.5”, Gray Dun with Black Nose Registered Jennet. Sire: Merychippus J.R., 35”, Gray Dun. Dam: Merychippus Mitzi, 34”, Gray Dun. Sugar is a lovely, dark nosed Slate Gray jennet. She is very gentle and has a sweet personality. She has been a consistent producer of small, colorful foals. 5/5/92, 33.5”, Gray Dun Jennet. Sire: Sormy Jack, 32”, Ivory with Blue Eyes. Dam: MDM’s Dorito, 35”, Gray Dun. Mae-Mae is a very lovely, conformationally correct Gray Dun jennet. She has always been in excellent health. She is an easy breeder and produces quality colorful foals. 2012, 33”, Black/Brown Registered Jennet. Sire: TFM’s Frito Bandito, 29″ 3***STAR, Spotted Gray White. Dam: Why Not Farm Dinah, 35”, Spotted Brown/White. Guacamole is a sweet and very gentle jennet. She has a wonderful personality. She has been a consistent producer of small, colorful foals. 4/23/95, 34”, Brown and White Spotted Jennet. Tina is very friendly and loves attention. She has excellent conformation and color. She is beautifully marked, and has a lovely face with expressive eyes. She is gentle and well mannered. Tina is a wonderful producer of show quality spotted foals. 4/30/96, 33”, Gray Dun Jennet. Sanora is very correct and has great conformation and sweet disposition. She is, and always has been, in excellent health. She is very affectionate. She is an easy breeder and produces tiny foals. 9/11/98, 31.5”, Ivory with Blue Eyes Jennet. 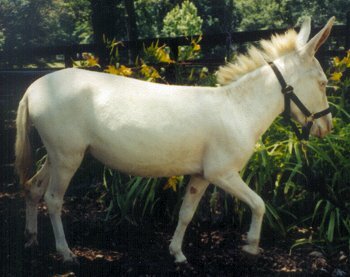 Sire: Stormy Jack, 32”, Ivory with Blue Eyes. Dam: Rocking D’s Sweet Amy, 32.5”, Slate Gray Dun. Buffy is a lovely Ivory White Jennet with Blue eyes. She is very petite, has great conformation, and is very well mannered. 1/25/84, 32.5″, Medium Brown 4****STAR Jack. Charlie’s Sire: Bruno #24, a 32″ Dark Brown Jack. Charlie’s Dam: Sophie #25, a 33″ Dark Gray Jennet. Charlie Bandito is the International Miniature Donkey Registry’s only current 4 **** STAR Registered Herd Sire. The only way a sire can reach this status is if enough of his offspring have been rated as superior quality 3***STAR status. The most well known and respected herd sire in the U.S.A. and Canada! 7/10/93, 32″, Black/Brown 3***STAR Registered Jack. Sire: Charlie Bandito, 32.5″, Medium Brown 4**** STAR Registered Jack. Dam: Bonnie’s Lucee, 32″, Gray Dun. Bonnie’s Sire is Italy Import Sam #47, Gray Dun. Bonnie’s Dam is Italy Import Lucinda #48, Gray Dun. Like his famous father, Pepper Bandito consistently produced foals with superb conformation and in a variety of colors, from solid jet black to light silver gray. 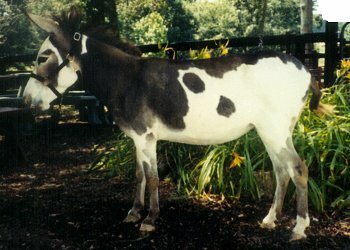 4/3/98, 29”, Gray and White Spotted 3***STAR Registered Jack. Sire: Black Pepper Bandito, 32”, Black/Brown 3***STAR Registered Jack. Dam: Sonata Farm’s Tina Turner, 34”, Brown and White Spotted. Frito is the son of Black Pepper Bandito who is the son of Charlie Bandito, the most well-known and respected sire in the USA and Canada. 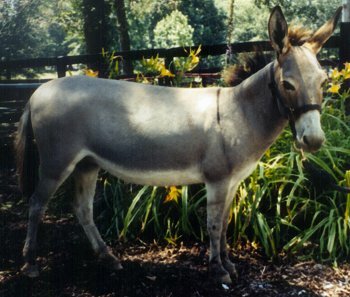 Charlie Bandito is the only 4****STAR herd sire registered with the International Miniature Donkey Registry. Like his famous Grandfather, Frito Bandito consistently produces outstanding foals. Frito is a beautifully marked with perfect conformation. He has a beautiful head, big expressive eyes, straight legs and a showy attitude. He is very gentle and sweet. 6/20/18, Birth Height 19″. Black NLP Jack with Blue/Grey eyes. Sire: Trojan Warrior, 30.5”, Black & White Spotted (See Foundation Sires). Dam: Senorita Salsa, 30.5”, Brown and White Spotted Jennet (See Foundation Jennets). Black Jack has a puppy dog personality. He follows you everywhere. Rare No Light Points (NLP) ALL BLACK color with Blue/Grey eyes! 6/5/18, Birth Height 19”. Grey/White/Sorrel Roan Jack with Blue/Grey eyes. Sire: Trojan Warrior, 30.5”, Gray & White Spotted (See Foundation Sires). Dam: Rocking D’s Little Buffy, 31.5”, Ivory with Blue Eyes (See Foundation Jennets). 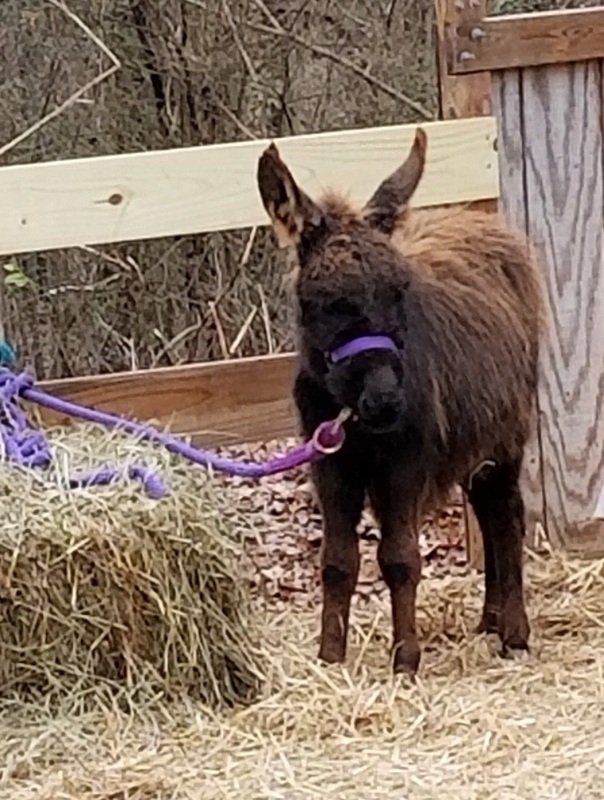 Chimi is a very tiny and petite rare color Jack that loves attention. He has exceptional conformation and an impressive pedigree. He has a beautiful head and large, expressive eyes. 6/20/18, Birth Height 17”. Black/Brown Jack with Blue/Grey eyes. Sire: Trojan Warrior, 30.5”, Gray & White Spotted (See Foundation Sires). Dam: TFM’s Bandito’s Queso, 30.5”, Spotted Brown and White (See Foundation Jennets). Danke is a very tiny, bottle raised Black/Brown Jack that loves attention. He has been used in Therapy Programs. 10/10/18, Birth Height 16”. Grey Dun Jack with Blue/Grey eyes. Sire: Trojan Warrior, 30.5”, Black & White Spotted (See Foundation Sires). Dam: TFM’s Bandito’s Chalupa, 29.5”, Grey Dun (See Foundation Jennets). Taco Bell is a very tiny Jack with beautiful conformation and adorable white “bangs” with big expressive eyes.